5-3/4” wide true square edge milled to create nearly invisible joints for a custom “Sand & Finish” look without the time, dust and mess of a custom project. Long Length Planks up to 7’ (most skus will only have 1 -2 split boards per carton). Provides fewer seams enhancing the look of the floor & making installation and maintenance easier. Dry-Sawn-Face 4mm(5/8” platform) or 3mm(17/32” platform): may be sanded & refinished up to 3 times. Great alternative to higher priced & shorter lengthEuropean & Canadian Brands like Kahrs & Lauzon. See competitive value of our White Oak & Jatoba price points, for example. 3-ply Cross-grain solid Hevea core enhances stability by resisting shrinkage, expansion & warping. All Nature’s Beauty® products are CARB II and Lacey Act compliant. 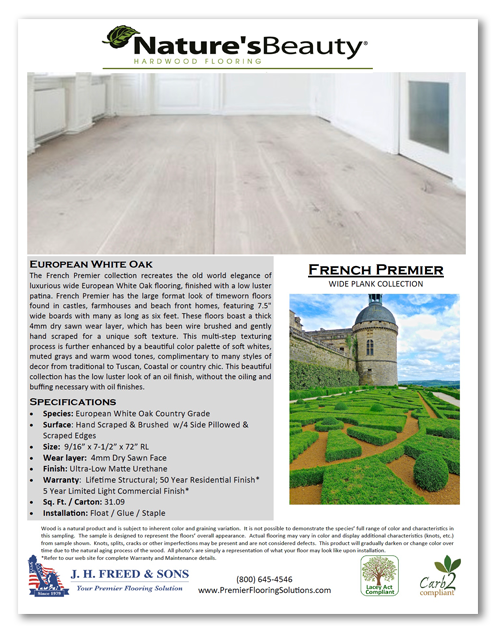 7-1/2” wide country grade European White Oak The old world elegance of luxurious wide European White Oak flooring resembling timeworn floors used for centuries in castles, monasteries, farmhouses, Villas as well as contemporary modern living such as beach front homes. Random lengths up to 72” with high percentage of full length boards. Provides fewer seams & enhances the appearance of the floor while making installation and maintenance easier. 4mm hardwood face: same as a solid hardwood floor (above the nail line). Live-Sawn (for natural features): Uses the entire log & produces a variety of beautiful grain patterns within each individual board. Tight straight rift & quarter sawn, medullar flecks along the edges, cathedral graining & natural variations to create the character seen in historic French Châteaux. Shows all the various idiosyncrasies of the log, including knots, pith, worm holes, mineral deposits and other naturally occurring elements which add richness & warmth. Each board is unique with its own character & always remains timeless. 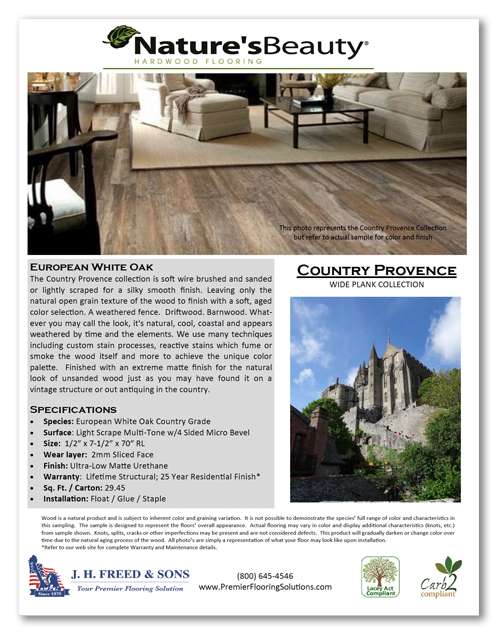 European White Oak: very hard, tight grain, low porosity with higher tannin content. Over time, matures from rich amber to a natural deep golden brown tone that never goes out of style. “Dual Texture”– wire brushed & gently hand scraped: provides for a unique subtle texture w/4 Side Pillowed/Micro Bevel & Scraped Edges. The look of a 200-300 yr. old floor out of the box. Ultra-low Matte Urethane w/AO finish enhances the wood grain & provides the look of an oiled finish without the re-oiling and maintenance required by higher priced oiled & UV oil finished floors. 7-1/2” wide country grade European White Oak – with all the original defining uniqueness of wood such as knots, pits, worm holes and other naturally occurring elements which add richness and warmth. Soft wire brushed & lightly hand sanded or gently hand scraped face provides an almost smooth floor w/ the visual textures of a natural look while hiding wear, just what consumers are asking for today. Textured visuals scraped/brushed provide the look of a 200-300 yr. old floor out of the box. Random lengths up to 70” with high percentage of full length boards. Provides fewer seams & enhances the appearance of the floor while making installation and maintenance easier. Sliced-Face 2mm: the appearance of a solid wood floor at a significantly lower cost. European White Oak: very hard, tight grain, low porosity with higher tannin content which enhances the unique multi-tone coloring technique (with some colors fumed). 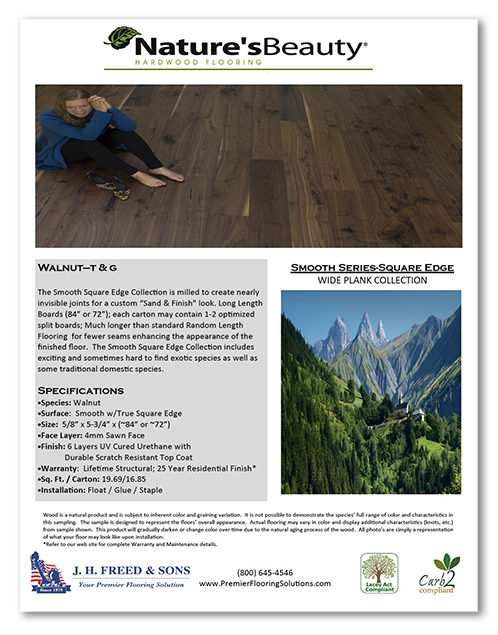 Ultra-low Matte Urethane w/AO finish enhances the wood grain & provides the look of an oiled finish without the re-oiling and maintenance required by higher priced oiled floors.